Best bets for dining at Seattle-area Vegas-style restaurants. There was not one. Not two. Not even three or four. On the evening I dined at Terra Vista recently, there were five luxe steak options available, from the “low-end” Delmonico ($47) to the primo côte de boeuf (a shareable 48-ounce American Wagyu rib steak for $160). As surprising as the price of that rib steak may be, the bigger surprise perhaps is where it was being served: 26 miles east of Seattle. Barely discernible from Interstate 90 just past Echo Lake is Snoqualmie Casino, home to five restaurants, of which the most elegant is Terra Vista. So perhaps those indulgent steaks make more sense now. With the arrival of Vegas-style casinos in our area in recent years has come the glitz and glam of the fancy casino restaurant, an effort to echo high-stakes Las Vegas dining in the manner of Picasso at Bellagio or Joël Robuchon at the MGM Grand. Two in particular, Snoqualmie Casino in Snoqualmie and Tulalip Resort and Casino in Tulalip, near Marysville, have placed their bets on notably upscale offerings. 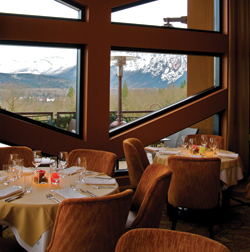 Terra Vista wows with those extreme steaks and sweeping Cascade views. Tulalip Bay showcases elegant dishes with an award-winning wine list that emphasizes local winemakers. While it may not be fair to judge these restaurants based on the symbiosis they share with the casinos, the venue has an undeniable influence on the experience. Which, for some, comes with that slightly creepy feeling of being in a casino. We are, after all, in the Northwest. Not on the north end of The Strip in Las Vegas. The shock and awe of over-the-top menus from A-list chefs is de rigueur there, as are the 24-hour party scene, endless window shopping of the Prada type, and high rollers with a Breitling watch on one arm and a beauty on the other. That setting imbues high-end Vegas restaurants with a dazzle factor that’s hard to replicate elsewhere. Anyway, that level of showiness, flagrant spending and self-indulgence is anathema to our region’s Nordic sensibilities. How well a Vegas-ized menu translates here is a matter of perspective. Just as I was taking in some of those lofty prices on Terra Vista’s menu, I’ll be damned if the man in the next booth didn’t order one of the nightly specials: an American Wagyu tenderloin with Maine lobster, for a cool $125. Later, chef Bruce Dillon told me that, indeed, on most nights, all the premium steaks get ordered. It translates well for some, no doubt. But soon after, a couple seated at a nearby table glanced at the menu for a few minutes, then left. Perhaps the buffet was more their speed. So I had to laugh when my dessert was set in front of me. The menu had indicated cherries would accompany the elaborate chocolate marquise, but there were strawberries instead. “Cherries are out of season,” our server explained. And in October, strawberries are in season? I’d have been happier with dried local cherries plumped in port. You can certainly eat local to a degree, such as the Mad Hatcher chicken from Ephrata, Washington, roasted and served with quince chutney, or pan-roasted halibut with sorrel velouté. But it’s hard to accomplish the local-sustainable goal and reckless gastronomic abandon at once. It’s a different dining experience at Tulalip Bay. The Tulalip Resort and Casino is anchored by the original casino, which opened in 2004. The resort element—with its upscale hotel and spa—was added in 2008. Just off I-5 and flanked by an outlet mall, this is far less secluded than Snoqualmie and much more accessible. Dinner felt more relaxed here, and the restaurant more confident in what it has to offer. Ornate décor includes a Chihuly chandelier in the private dining room (visible through a panel of etched glass). The extensive wine list, overseen by sommelier Tom Thompson, has garnered Wine Spectator cred with the Award of Excellence every year since 2007. And chef Dean Shinagawa, who at one time led the kitchen at Roy’s in downtown Seattle, ventured to New York to cook at the venerable James Beard House a few years ago. Tulalip Bay has built more of a bridge between the casino and the broader dining public, with food and wine events like November’s Taste of Tulalip. The menu here has fewer extremes, topping out at $75 for filet mignon with a Maine lobster tail. Most other entrées—such as crab-crusted Alaskan halibut and an oven-roasted half duck, both quite delicious—fall in the $25 to $50 range, with a few starters for less than $10. The Asian-inspired menu has an appealing array of selections to suit different moods and budgets. But is price the object? I thought that was why casinos offered alternate dining venues, for those budget-conscious occasions. Dinner at Tulalip Bay—the casino’s finest dining option—was perfectly enjoyable, but it lacked the “wow” factor associated with upscale casino restaurants. Which is perhaps a perfectly Northwest position for it to take, and proof that we are not now, nor will likely ever be, the Las Vegas of the Northwest. After I scored one of my first jackpots in Las Vegas, we dined at acclaimed chef Nobu Matsuhisa’s Nobu in the Hard Rock Casino. It was a thrill to splurge on a sublime bottle of Billecart-Salmon Champagne. And pay for it with cash, baby! That’s the beauty of those pricey casino restaurants, outstanding places to spend your just-earned winnings. Or put it on the old credit card and simply pretend you’re a high roller for the evening. 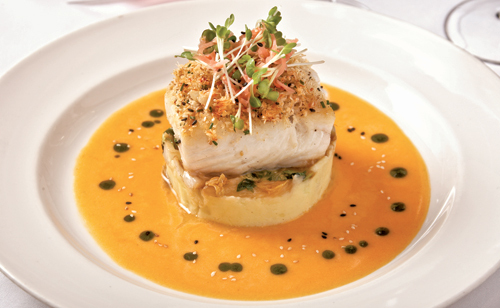 Both Terra Vista and Tulalip Bay do a fine job on the fine-dining front. But neither really serves up the kind of splurge-worthy experience that I associate with high-end casino dining. Love ’em or hate ’em, the celebrity chefs who dot the landscape in Vegas bring cachet, glitz and financial backing to the table. And folks who flock to Sin City relish having their pick of some of the world’s best chefs. Seattle has a history of tiring of nationally known chefs: Wolfgang Puck (Obachine), Jeremiah Tower (Stars), Todd English (Fish Club) and, more recently, Terrance Brennan, whose Artisanal lasted only nine months at The Bravern. Instead, the celebrities we warm up to in Seattle tend to be local chef-owner types who live and work among us. The celebrity-casino-chef element just doesn’t come into play here the way it does in Vegas—which is as right as Seattle rain. But it won’t stop me from waltzing into Terra Vista after I hit a big jackpot at Snoqualmie, cash in hand to pay for a big fat martini and that $80 Tomahawk steak of Wagyu beef. Until then, look for me at the Falls Buffet for its Friday $27.95 seafood feast, piling on the Dungeness crab with abandon.